70th Birthday Gift. Genealogy Last Name Print. Surname Print. Consider this 70th birthday gift that will be kept forever. Ever wonder about the meaning and origin of your family's last name? This beautiful genealogy print gives several paragraphs of information about the origin of your family's last name, prominent namesakes with that name, and the country of origin. 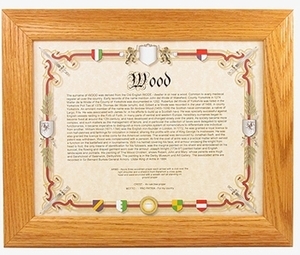 The genealogy print also includes a description of the arms, crest and motto of the family. Printed on a beautiful heraldic artwork in an 8 1/2" x 11" oak frame. This 66th birthday gift will be one that is handed down through your family. Note: Not all surnames are included in our database. If your last name is not included, we will contact you immediately to let you know . See also our other 70 gift ideas.